Around this time of the year many folks are thinking about sending out Christmas cards. I have one sister who sends them out the day after Thanksgiving. Hers is the one that I receive first every year. There are lots and lots of ways to send out your Christmas greetings. Some people use Christmas time as an opportunity to send out an annual update on what has happened throughout the year in their family. Others, like myself, enjoy hand-making cards for the loved ones in our life. If you are not into letter-writing or home-made crafts, you can get lovely preprinted cards from just about any store. Something that makes a card special is a personal message on the inside. Why not add a great Bible verse to your Christmas card? Here are twenty verses that I think will work well no matter what your medium for mailing the Christmas greetings. Isaiah 7:14 Therefore the Lord himself will give you a sign. 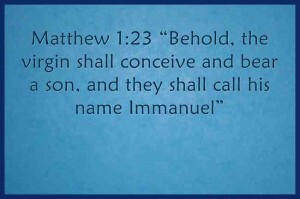 Behold, the virgin shall conceive and bear a son, and shall call his name Immanuel. Matthew 2:10 When they saw the star, they rejoiced exceedingly with great joy. Isaiah 9:6 For to us a child is born, to us a son is given; and the government shall be upon his shoulder, and his name shall be called Wonderful Counselor, Mighty God, Everlasting Father, Prince of Peace. Zechariah 9:9 Rejoice greatly, O daughter of Zion! Shout aloud, O daughter of Jerusalem! Behold, your king is coming to you; righteous and having salvation is he, humble and mounted on a donkey, on a colt, the foal of a donkey. Acts 5:31 Him hath God exalted with his right hand to be a Prince and a Saviour, for to give repentance to Israel, and forgiveness of sins. Isaiah 11:1 There shall come forth a shoot from the stump of Jesse, and a branch from his roots shall bear fruit. Matthew 1:21 She will bear a son, and you shall call his name Jesus, for he will save his people from their sins. Matthew 1:23 “Behold, the virgin shall conceive and bear a son, and they shall call his name Immanuel” (which means, God with us). Luke 1:30-31 And the angel said to her, “Do not be afraid, Mary, for you have found favor with God. 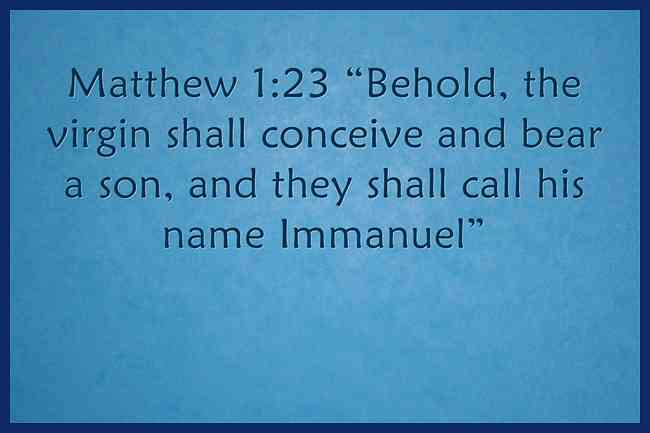 And behold, you will conceive in your womb and bear a son, and you shall call his name Jesus. 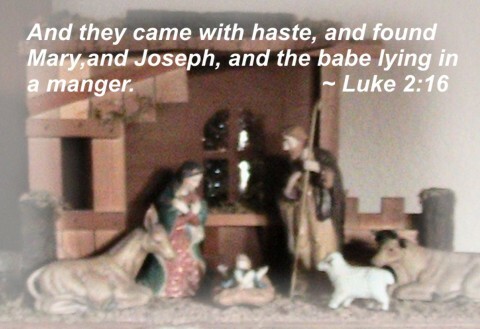 Luke 2:15-16 When the angels went away from them into heaven, the shepherds said to one another, “Let us go over to Bethlehem and see this thing that has happened, which the Lord has made known to us.”And they went with haste and found Mary and Joseph, and the baby lying in a manger. Luke 2:10 And the angel said to them, “Fear not, for behold, I bring you good news of great joy that will be for all the people. Luke 2:11 For unto you is born this day in the city of David a Savior, who is Christ the Lord. 2 Corinthians 9:15 (KJV) Thanks be unto God for his unspeakable gift. James 1:17 Every good gift and every perfect gift is from above, coming down from the Father of lights with whom there is no variation or shadow due to change. Great article, I think I might use of these. Thanks for stopping by WCWTK Kaanon. Also thank you for your kind words. Blessings! Wonderful , m realli blessed. Thanks verses love this Gods Word!KJV IS THE PERFECT BIBLE . Actually, the King James is NOT a perfect version of the English Bible. It was the third translation of God’s Word into English, and the translators misinterpreted many of the words/meanings from the original text. Case in point: the KJV mentions “unicorns” NINE times (when the translation should have been “wild ox.”) The ESV is a much more accurate translation. Sarah, you haven’t done your research. The first edition Noah Webster’s Dictionary from 1828, says: “Unicorn – An animal with one horn; the monoceros.” This name is often applied to the rhinoceros which is more likely than a wild ox. “Prove all things; hold fast that which is good.” 1 Thessalonians 5:21 (KJV) God’s Word is infallible. Trust it, trust HIM. Interpreting the Bible belongs to Him alone. The Spirit will bring you into truth, not any specific translation. There are people dying and going to hell all around you, let’s focus on seeing them saved, not defending an opinion on translation. The Bible is the perfect Bible. Hi Edet … thanks for the words of encouragement! Blessings to you. is this your website …you are baptist? I hope this answered your question. Thank you for stopping by. Thanks for posting this list! I make handmade cards for Christmas each year and many family members are not believers. So I use my card as an opportunity to share the Truth with them in a meaningful way. This list helped me choose just the right one! Hi Mira, So happy you could use some of the content from this article. I quite agree with you. The world needs more of the Bible. Thanks for taking time to leave your comment and MERRY CHRISTMAS! Thanks for sharing such versus, dear. It was really helpful to me. I was just preparing a complete topic for this Christmas Eve Meeting. Again thanks, May God bless you. Thanks for the great verse…..I celebrate my christmas reading these verse….I feel Im really blessed…Thanks for helping me to celebrate chrismas even though Im alone. Many thanks for these awesome verses, I will be utilizing these for our Sunday School anniversary day.God bless you for now and in the future. Thanx for this website saxon. It really helped me for school. Great article, thanks so much for posting! I am designing our family Christmas card and decided to google Bible verses to try and decide which one to put on the card. This article was PERFECT! Thanks again! This was very helpful. Though I will be taking these verses from my kjv Bible. I am making Christmas cards for my church. Solid Rock Baptist in grand rapids, mi. I am decorating a Christmas tree for our ladies ministry at my church and I’ve made ornaments with these verses. Your website helped me to do this quickly and also blessed my spirit as I did it. Thank you very much. Merry Christmas. Thanks for letting us know Robbie … this is encouraging. I love decorating the church with the ladies! Thanks for your website, it help in my preparation of Christmas program. God bless! Thank you for taking the time to compile these! We have a group of teens who are using the illumination process to make Christmas cards and these verses will be perfect for them. It saved me the time having to look up the verses myself. I intend to use a verse in our Church Christmas card which is delivered to all in the local community, your verses are so appropriate. Thanks Pam. I love all these verses. You saved me so much time. I thank you for taking the time to find these and provide them for me. God bless you wife, Mom and Grand Momma. I really belive in Jesus =DD .. Thaaanks Pam for having this blog .. may God bless u .. Merryyy Christmas .. I am so happy you stopped by Lauraa … Merry Christmas! thank you for these great jobs,May God Bless u. Thank you for this! I am using these to make advent chains for my kids. One of these years I will get the advent chains done on time. How fun Shauna! My grandson (3 years old) made a chain to count the days when they will see their Grammy at Christmas time. They far from me and, Lord willing, we will travel to see them at the end of the month. Thanks for sharing your idea here. any suggestions for a verse,psalm,promise,proverb,poem to put on a Christmas card for unsaved people . Its Great Pam. I was searching some short of bible verses. You collected related verses. It made me easy. PTL. from Nepal. Fantastic! So glad you could use these. Thanks for taking the time to post your encouraging words. Merry Christmas and Joyous New Year to you too Cynthia … so glad you found what you needed! This is my first year making homemade Christmas Cards. I wanted something a little more fitting than the usually card verses. Thank you so much for taking the time to write all of these down for everyone. We need more people like you. This website really helped me with my gifts for Christmas. I am writing Bible verses for a bucket, and everyone is going to draw one out. I was stuck and needed help with the verses. Thank you very much for this website. Thank you and Merry Christmas! Wonderful. I really enjoy reading through. I we like to read more of it every day. Thanks for this! I give out bookmarks with Bible verses as souvenirs to my students. This is timely for this term which coincides with Christmas. God bless and be with you more! Pam- you are a messenger of God to the whole world and thank you for doing so. this weblog, this webpage is truly amazing. May the magic and thrill of the holiday season stretch on! This blog provides useful information for us thanks for your work.